Some years ago, stand-up comedian Alan Committie had the audience, as the phrase goes, bust a gut; his hilarious restaurant sketch was brilliant in its simplicity. All he did was to read aloud with comic intonation and some satirical pitch the menu of an upmarket Waterfront establishment. The only intelligible item was ‘cranberry jus drizzled over Karan beef’. The restaurant has since gone under. I was reminded of that sketch recently at a name-chef, designer-architect restaurant in London. Asking the waiter to help decipher the menu felt like being on some dastardly television game show. I was to choose between creamed morels, handmade ziti with celeriac foie gras cream, salad mache, sharham park spelt risotto, cream of ratte potatoes or Scottish girolles. It’s what my dinner partner, Munchkin, calls ‘queen cuisine’. I’ve observed before how personalities transform and match the style of food they are busy consuming; perfect savages at the open braai, suddenly become pretentious, fussy and smug in a high-end restaurant. What I want out of these places is evidence of thorough research and hard application; the very best raw ingredients, the rare and the exquisite, thoughtfully prepared and served in a setting that gives one the maximum comfort. Some take this to unnecessary extremes. Alain Ducasse at his New York restaurant offered one a choice of fountain pens with which to sign the cheque, and at one of his Paris establishments, presented a trolley with a dozen types of rum to taste before choosing which you preferred them to use in dessert. Not that long ago, many South Africans considered eating out, except on special occasions, sinful. Dining out was profligate, gluttonous, and slothful. I still get outraged paternalists commenting on this column: “R500…Do you know how many bags of mealie meal, bottles of cooking oil, bags of sugar, cans of pilchards that would buy?”, and my recent favourite, “It is disgusting to charge that amount of money for one meal… I feel like choking on my own vomit”. Some upmarket restaurants, like the award magnet Jardine, still battle with negative expectations: “it will be too expensive, the menu in a foreign language, the food gimmicky, the waiters condescending, the company pretentious”. Jardine is none of these, but it is certainly a kitchen with ambitions. I’ve eaten here every year since they opened in 2006, and I have never been disappointed, though sometimes the food arrives close to room temperature, possibly from all the fiddling involved in its beautification. Theirs is not the kind of food you want to hurry over, but they are developing an a la carte business lunch trade. The bread rolls arrive speedily and piping hot from their busy bakery downstairs. Within an hour, they manage to ease you through three courses. Reasonably priced for this class of establishment, a two-course dinner is R230, three courses R260; enough to feed a family in a shack for half a week according to one of my readers. The 5-course chef’s menu (R400) is a treat, incorporating the best of the day’s dishes. The menu changes daily. Each dish is presented on its own plate. 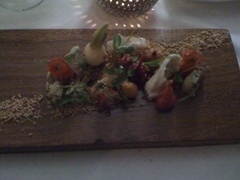 I have enjoyed the organic Porterville vegetable garden with onion ‘soil’, a miniature parterre of delicate baby vegetables – beetroot, onion, radish, exotic mushrooms – with nasturtiums and edible flowers; different varieties of fig with eucalyptus pollen, fennel, ricotta cheese, served on a stone slab. Judging the correct softness for a boiled egg to mix into a Ceasar salad is tricky; Jardine’s cunning solution is to serve it lightly poached on top of the cos lettuce. Belgian endive is not a vegetable you find often enough on our menus. They serve it on a transparent plate with an orange and saffron (which was overpowered) braised organic baby fennel. For mains: the ribeye with bone marrow; the peppered Chalmar rump (shy on the pepper) served sliced, with the fat on, accompanied by soft polenta and a delicate elf, eryngii and shimeji mushroom ragout; medallions of aged, grain-fed rump served on a wooden block, the fine green beans tied (in somewhat passé fashion) in a little parcel; roasted warthog loin with a potato, cabbage and granola cake, and chestnuts (the accompaniments were tastier than the slightly too rare wild pig). This is food with an attitude, a bite that makes you sit up and take note. No salt or pepper on these tables. Among the desserts my favourites are the caramelised lemon tart, which is very tart; the vanilla soufflé (they have an espresso version too)flambéed at the table, the waiter then adds a dollop of vanilla ice-cream, melting into its frothiness. They have a dedicated sommelier and the wine list is excellent, but with few options below R180. George Jardine will soon open a lunchtime restaurant on the Jordan Wine Estate, Stellenbosch, hurrying back to take charge of dinner with his very capable head chef, Eric Bulpitt. In short, Jardine is one very professionally run restaurant. Jardine Restaurant, 185 Bree Street (corner of Bloem Street), Cape Town. Open for dinner, Monday to Saturday; for lunch Wednesday to Friday. Tel: 021 424 5640. Published in the Mail & Guardian April 30, 2010.